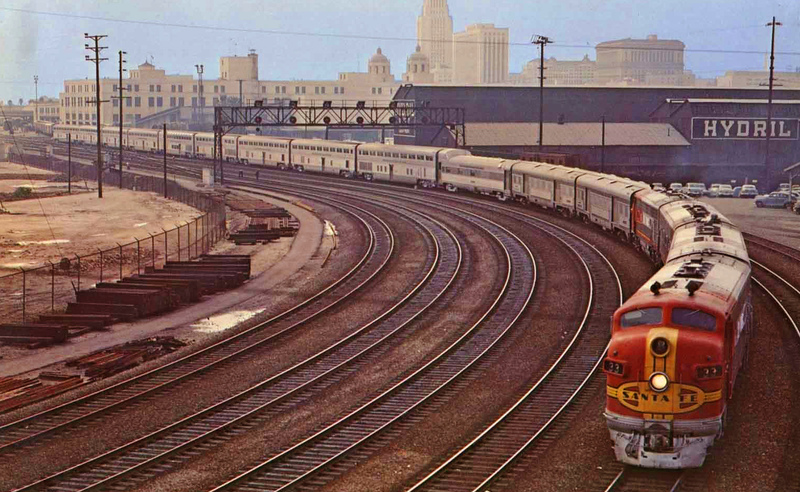 The Santa Fe’s El Capitan was another of the railroad’s premier passenger trains connecting Chicago with Los Angeles. However, unlike the Chief and Super Chief the El Cap provided no Pullman sleeper service and was an all-coach operation. Nevertheless the train was extremely popular (partly due to its super-scenic route), running in a super fast schedule. It is perhaps best remembered for the Hi-Level cars it employed, the first application of such cars on a long-distance passenger train that were mimicked in Amtrak's Superliner series. As an all-coach intercity service the train was certainly one of the most luxurious to be found anywhere across the country. Until the end the Santa Fe retained very high service levels aboard the El Cap until the spring of 1971 when it, along with the rest of the Santa Fe passenger fleet, was handed over to Amtrak. What led the Santa Fe to become such a heralded railroad amongst the public was its introduction of the Chief passenger train in late 1926, and then the Super Chief ten years later. In the late 1930s its legendary Warbonnet livery was born, designed by Electro-Motive's Leland Knickerbocker. The original version of the scheme was developed for the lines and curves of Electro-Motive's E1 streamlined diesel, and later adaptations were worn by all types of Santa Fe equipment becoming a true classic. 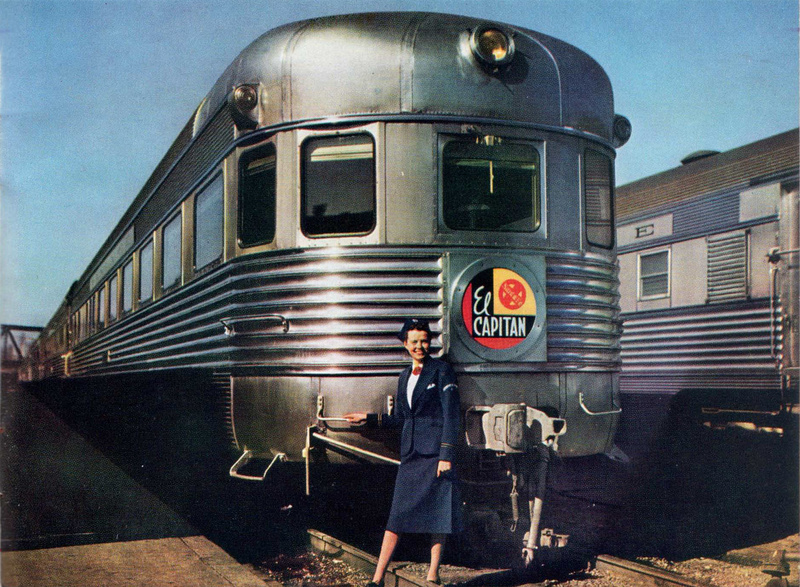 The El Capitan (which is derived from the Spanish influences of the Southwest regions during the 1700s) was inaugurated in February 1938 and born primarily to help supplement the incredibly popular and luxurious Super Chief as a low-cost, economy-friendly version of Santa Fe's flagship train. The El Cap came fully equipped with streamlined equipment from the Budd Company. All stainless steel in nature the consist included a baggage-dormitory coach, two 52-reclining-seat coaches, a lunch counter-diner, an a coach-lounge observation. coaches with reclining seats, lunch-counter diner, and a coach observation car. The train (two sets) was unveiled at Chicago's Dearborn Station alongside a steam-powered Chief (led by streamlined "Blue Goose" 4-6-4 #3460), and flagship Super Chief. An incredible 30,000 folks came out to tour the new trains and they had to be impressed by what they saw; streamliners were all the rage at the time and colorful, sleek trains were an entirely new fad the public was not used to, accustomed to diminutive standard black and Pullman green. The on-board amenities also surely wowed those in attendance. 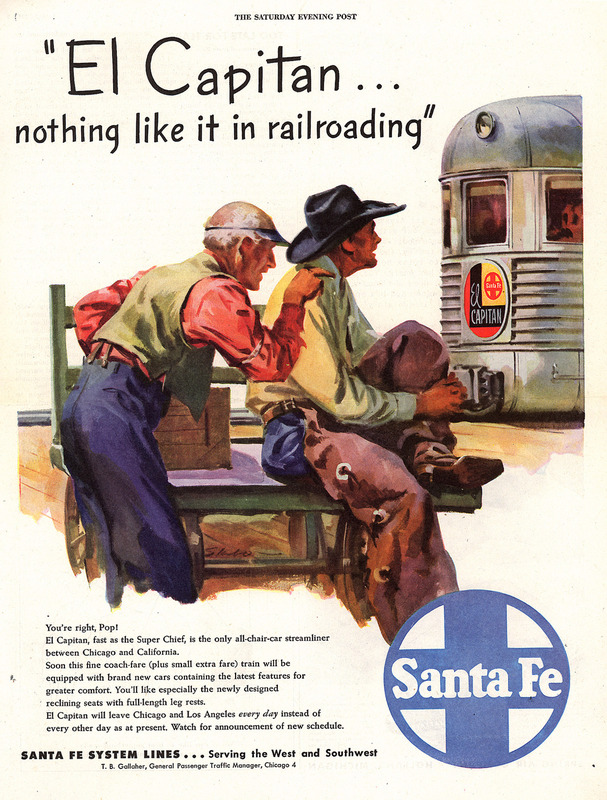 At first Santa Fe considered naming its coach-only consist the Economy Super Chief, which really didn't have much of a ring to it. So, instead they chose El Capitan and the train was christened on February 22, 1938 nearly a year behind the inauguration of the Super Chief, which had first hit the rails on May 18, 1937. Four days later Santa Fe continued growing its fleet in an attempt to keep up with demand, launching a second Super Chief on February 26th. During the 1940s the El Cap received new equipment and upgrading, twice during 1941 and 1948. The former provided enough cars to allow the train to run in each direction three times weekly. The latter, however, finally allowed the Santa Fe to advertise the El Cap as a daily departure in each direction. Then, in the mid-1950s the train was given more upgrades, this time to the extent that the El Cap earned near legendary status. 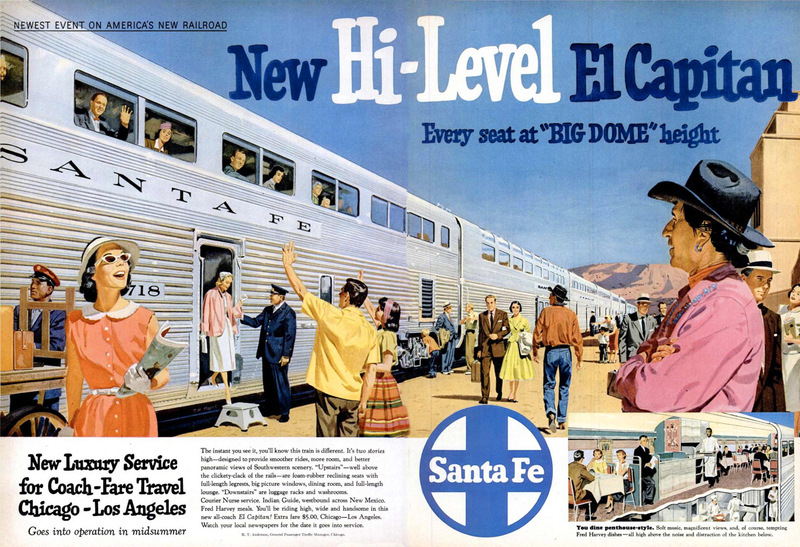 In 1954 the train received full-length dome cars that the Santa Fe named "Big Domes," allowing passengers unparalleled views of the spectacular scenery along the Santa Fe's Chicago to Los Angeles Transcon main line. 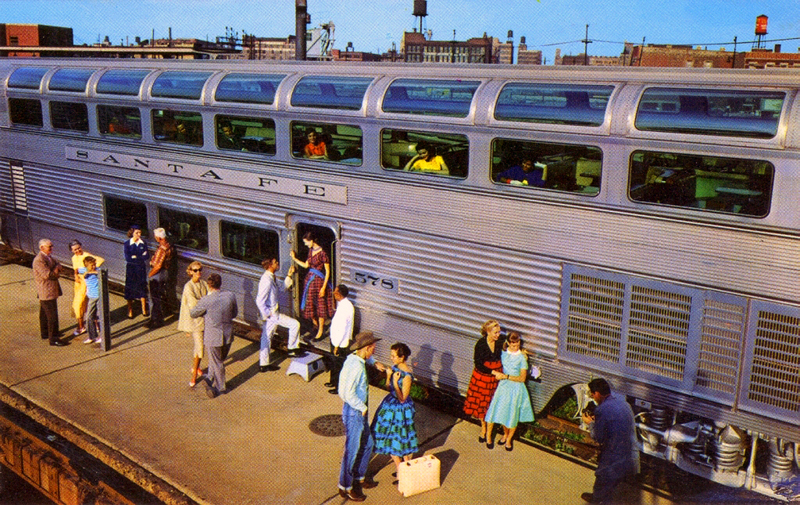 On July 15, 1956 the El Cap received its signature cars, Hi-Levels, another innovation of the Budd Company, which came equipped as diners, lounges, and coaches. The Santa Fe listed the El Cap as Trains #21 (westbound) and #22 (eastbound) on its official timetable. Departing Chicago's Dearborn Station at 5:45 pm the train could make the westward jaunt to Los Angeles in under 40 hours, arriving at Los Angeles Union Passenger Terminal (LAUPT) 7:15 am, a day and a half later. Quite fast, the train carried an average train speed better than 56 mph even with 22 to 23 stops along the way. Additionally, the railroad offered connecting services to Denver via La Junta, Colorado and Phoenix via Ash Fork, Arizona. 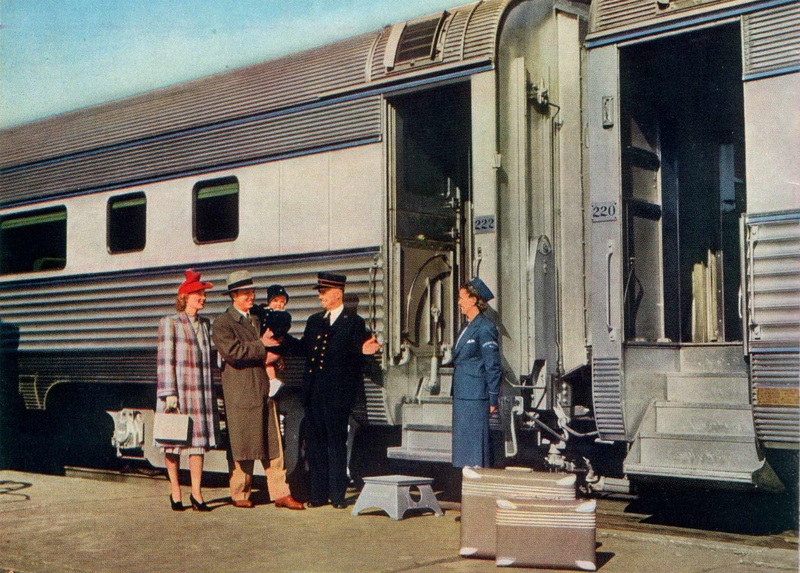 A typical consist for the upgraded El Capitan included baggage-dormitory-lounge, reclining seat coaches, diner, dome, and observation all of which, of course, were Hi-Levels. 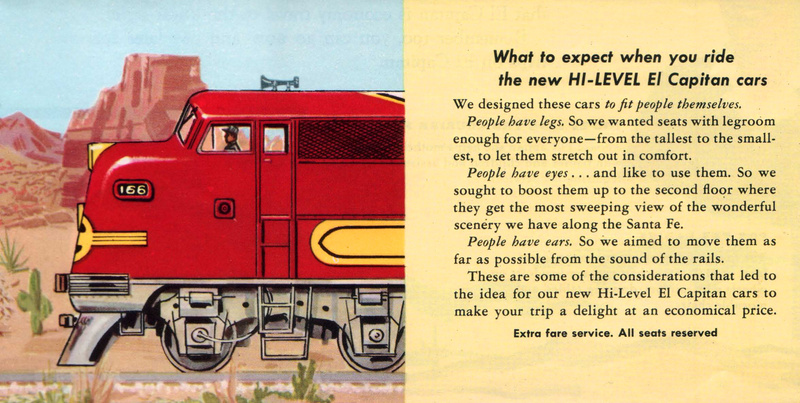 Now commonly seen on commuter trains (even back then as well) and long distance Amtrak passenger trains, the Hi-Levels were a new concept on intercity passenger trains at the time. Not only was the car more economical by allowing twice the seating in the same amount of space but also provided passengers a quieter and more comfortable ride from the top level. For more reading and historical ads and brochures featuring the train please click here. The El Cap remained a popular choice for travelers even through the 1960s due to the scenic views and fast schedule between Los Angeles and Chicago. What other railroad offered an "economical" train with so such a high level service and incredible scenery? 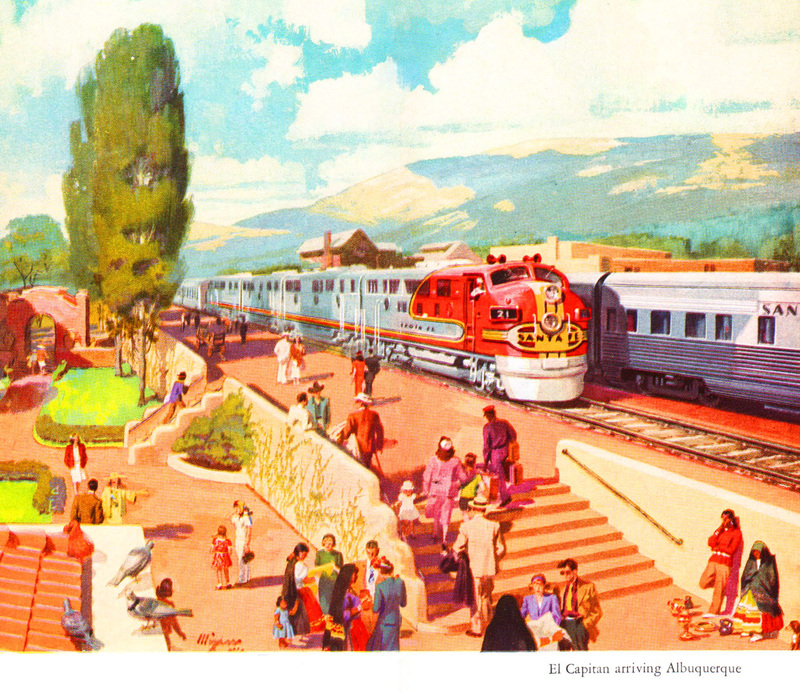 While downgrades did occur, even on the El Cap (the most notable its combination with the Super Chief during the late 1960s), Santa Fe did not waiver in excellent on-board services right until the end when Amtrak took over the Santa Fe's vast and vaunted passenger operations on May 1, 1971. Today, amazingly, some of the Santa Fe's Hi-Level coaches remain in operation on the Amtrak system, along with the passenger carrier’s newer Superliners.